Thanks for posting Local Hiker. Very unusual. You could have used one of those for Guess the Place. I'm sure a lot of people would have struggled to guess it correctly for a while . 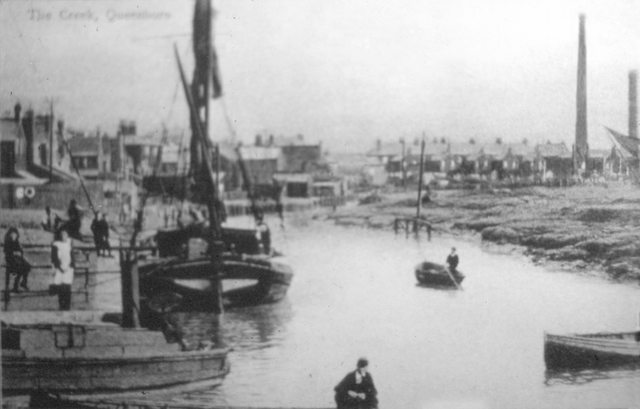 Queenborough Creek provides a harbour to a small fishing fleet and other commercial vessels. It does not have an entry in "Dockyards & Harbours", so I have added this entry. I took the following photos at low tide today. I sailed into the creek at high tide some years ago, passing a lock gate at the entrance. As the photos show, the water was not retained by the gate today. A quick Google confirms that the gate is a flood barrier to stop very high tidal surges coming in. It is operated by the Environment Agency. It is not to stop the creek emptying as the tide recedes. There is a fresh fish stall open on Thursday, Friday and Saturday.